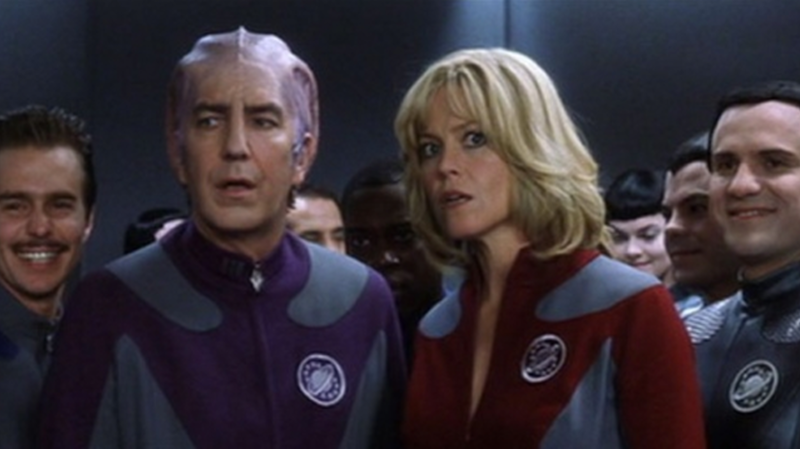 Fifteen years ago, Galaxy Quest premiered in the U.S., adorably and amusingly skewering the sci-fi movie genre in ways that remain funny and fresh to this day. To celebrate, here are 20 things you might not have known about the movie that proved you don’t have to set out for space on the U.S.S. Enterprise in order to explore brave new worlds. You know the movie's big baddie, Sarris? He was reportedly named after film critic Andrew Sarris, who was outspoken about his dislike of producer Mark Johnson’s previous effort, The Natural. Well, kind of. His Alexander Dane was supposed to have been the recipient of an honorary knighting by Queen Elizabeth, but Rickman himself thought that such an event didn’t jibe with his character. Still, Dane is billed as “Sir Alexander Dane” in the film’s credits. “Galaxy Quest: 20th Anniversary, The Journey Continues” was a mockumentary that (quite effectively) tapped into the movie's universe and attempted to chronicle the making of the fake Galaxy Quest television show that inspired the satirical film. Fans of the film have been begging for a follow-up for years, but recent comments from star Tim Allen hint that something might actually be in the works, nearly twenty years on. At the very least, there are plenty of ideas for the script and other cast members have expressed interest in revisiting the material. At least, according to Trekkers who voted on the matter during the Star Trek 2013 convention in Las Vegas. In theaters, the first twenty minutes of the film were presented in the 1.85:1 aspect ratio, before blowing out into 2.35:1 when the spaceship lands on Thermia. Eye-popping! Although you can’t see GalaxyQuest.com anymore, the site was once live, and it amusingly took the whole “fake television show” gag to the next level. Instead of being a standard issue movie website, the page kept up the ruse that Galaxy Quest was a real show with real stars. It even included a giant trove of fake episode guides. His name was “Travis Latke,” and no one else loved Galaxy Quest quite as much as he did. The site included references and nods to "Travis," who took the time to thank his mom for paying the website’s server bills. Hard to believe, especially considering the young co-star had a major role in the final product. Long had previously goofed around with a comedy troupe, but Galaxy Quest was his first actual gig. Not a bad start. The Office star appears as one of the aliens in the film, and though his part is mainly confined to background work, he pops up in a number of deleted scenes. This was Wilson’s first feature film work—he had only been credited for a role on the soap opera One Life to Live before landing the part. And it was set to be directed by Ghostbusters' Harold Ramis. However, Ramis reportedly left the project when they insisted on casting Tim Allen in the lead role. Another option the original director wanted to explore was Alec Baldwin. Disney didn’t dig either choice and Ramis left the film, unhappy with his inability to cast it as he saw fit. The Thermians claim to be from the planet “Klaatu Nebula.” “Klaatu” is the name of the alien from the 1951 alien invasion thriller The Day The Earth Stood Still. At the end of Galaxy Quest, a trailer touts the return of the fake television series, slated to come back a full eighteen years after the show originally aired. Star Trek also saw an eighteen-year gap between two of its television series (1969 to 1987). Like Galaxy Quest, its film outings were not included in that gap. The sci-fi film wound up starring Robin Williams and notoriously bombed at the box office. Given his newbie status in the business, it’s no surprise Long almost didn’t snag the part. Other actors auditioned and came close, including Kieran Culkin, Eddie Kaye Thomas, and Tom Everett Scott. When the director visited the set, he suggested that Missi Pyle’s alien role be expanded, which is why a subplot involving a romance between her and Tony Shaloub was added in. And who can blame her? That thing looked amazing on her.